This Lemon and Blueberry Layer Cake is moist, zesty and sweet. It’s the ideal cake for May bank holiday. Get the recipe and get in the kitchen! No it’s not a word I made up. According to urban dictionary it means “the practice of baking something in order to put off doing something else you need to do.” It is something that I am definitely guilty of and when I should be tidying the house, doing laundry, and other boring chores the first thing I do is bake. I made this over the May Day bank holiday. Jon had taken himself off to the pub to watch a game of football and I found myself stuck indoors on a wet and windy day. There were a whole host of things I could’ve done instead of baking but the kitchen called. I decided as it was May Day on the Monday I should probably bake something to celebrate spring! Lemon and blueberry seemed liked the perfect flavour combination for the bank holiday. The sponge is light, flavoured with just a little lemon zest and vanilla. The layers are sandwiched together with a blueberry compote and the buttercream is given a wonderful sour tang with fresh lemon juice. I would have loved to have been able to top the cake with fresh blueberries but they’re not yet in season. We have a big blueberry bush in our garden which is going to be covered in blueberries come the summer. It’s so exciting seeing the flours turn into berries. Lemon and blueberry is such a classic flavour combination you can be sure that I’ll be making lots of exciting recipes when my blueberries are finally ripe. Just check out these other lemon and blueberry bakes from the blog in the past. To make this cake a real celebration of spring it had to be decorated with flowers. I wanted to stick to yellow and blue to represent the lemons and blueberries so I made a big batch of lemon flavoured buttercream and then separated it out into bowls to colour. I then took 3 icing bags, with 3 different nozzles and filled them with the buttercream. To get these colours I used the Royal Blue Wilton gel food colouring. The palest shade was made with a tiny amount of gel off of the end of a toothpick. The blue used maybe 2 or 3 toothpicks of gel and the dark blue was made with gel from the end of a teaspoon. I’d recommend adding as little as possible to begin with and adding more until you get the desired colour. You can’t take the colour away after you’ve added it! For the “design” if you can call it that I started by piping one large rose in the centre left of the cake with the Wilton 1M. I then did two slightly smaller roses above and below. 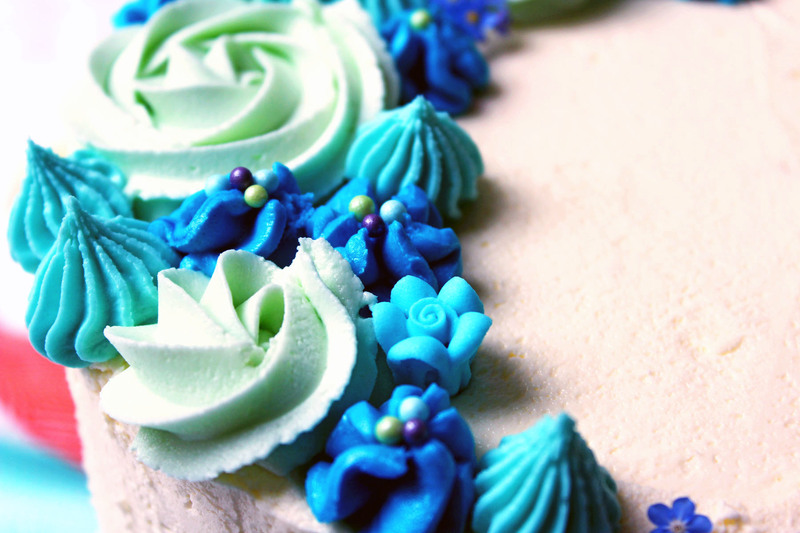 I then used the blue icing with the Wilton 4B tip to pipe clusters around the roses. Finally I used the dark blue icing with the Wilton 2D to to pipe drop flowers in the gaps. A few blue, green and purple sprinkles added the finishing touches. Adding real cut flowers from the garden also added a fun touch to make this cake a real celebration of spring! 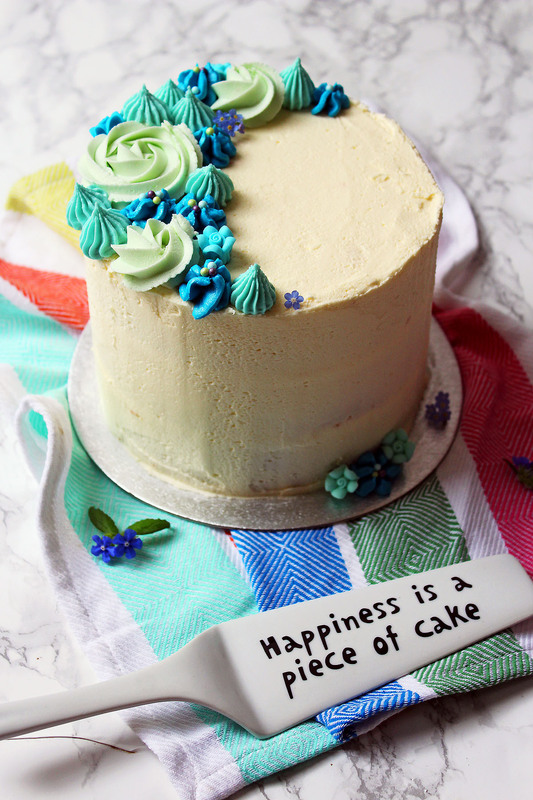 Of course you could use this deign to decorate any cake with any combination of colours that takes your fancy. You also don’t have to use Wilton nozzles though they are my favourite. As long as you have a few different sized open and closed star tips you’ll get the same effect. I wish I’d taken a photo of the cake sliced but as ever once the cake was cut it got eaten pretty quickly! Once you’ve made this recipe you’ll understand why. Pre-heat the oven to gas mark 4 (160 C), and line three 7 inch cake tins with grease proof paper. In a large bowl, whisk together the butter and the sugar until soft. Beat in the eggs one at a time and beat well until the mix is creamy and pale. Cut the vanilla pod in half and scrape out the seeds into the bowl along with the lemon zest then mix until combined. Sift the flour into the bowl and fold through until the flour is fully incorporated. Pour the cake mix into three separate cake tins and bake for 35 mins until springy to the touch and a skewer comes out clean. Allow to cool in the tins for 10 minutes before turning out on to a cooling rack. Once the cakes have cooled completely, it's time to make the buttercream. In a large bowl, beat together the butter, icing, and lemon juice. Place 3/4 of the icing into a large piping bag with a big round open nozzle. Divide the rest between 3 bowls and colour 3 different shades of blue. Place into 3 different icing bags with different star tips. Using some of the plain icing as "glue" place the bottom cake layer onto a cake board. Pipe a ring of icing around the top edge of the layer. Cover the rest of the top of the layer with blueberry compote. Place the second layer on top and repeat the ring of icing with blueberry compote filling. Put the final layer on top. Crumb coat the cake making sure you have a smooth base coat and all gaps between the layers are full. Use the remaining plain icing to cover the cake completely with a smooth finish. Take the 3 coloured icing bags and start by piping roses then clusters of the smaller flowers. Finish with sprinkles or fresh flowers if desired. You can of course make your own blueberry compote but until blueberries are in season I’ll be getting mine out of a jar! If you like this recipe please do share on Twitter, Facebook and of course Pinterest! It will make a fantastic cake to share with the upcoming bank holiday at the end of the month! I love the sound of lemon and blueberry in my cake.. This sounds so delicious. Can’t wait to try. Lemon and blueberry is so good together. Love the beautiful cake decoration. I love the combination of lemon and bleuberry! 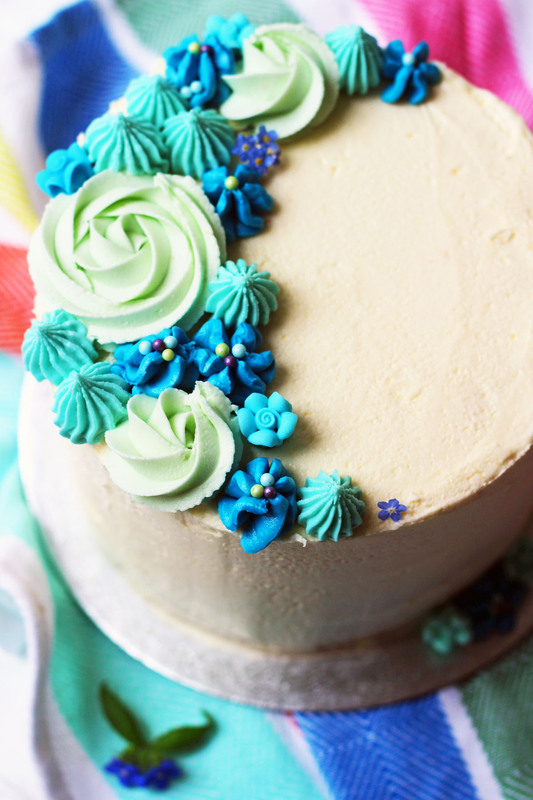 I am in complete awe of your icing design – I’m nowhere near competent with flowers so I’ll have to practice before I can make a cake look like yours! Definitely going to try out the cake recipe though – thanks! The beauty of this Fiona is that it requires little skill! For the roses just pipe a swirl going from inside to out. For the other two you just hold your icing bag upright, squeeze a little and let go. I admit… I’ve never procrastibaked.. in fact, I procrastinate so that I don’t have to bake! Lol. This cake looks delicious though- maybe you can bake and I can get our work done haha! What a gorgeous looking cake it is!! and the overwhelming flavours can have me dig the whole cake in a go. Thanks Sandyha. My sister said it was the tastiest cake I’ve ever made! I’m a professional procrastibaker! Paying bills? Banana nut bread. Working out? Brownies. Writing a blog post? Def cookies! Thank you for defining the mantra that is my life. Hahaha glad I’m not the only one Lisa 😀 we should set up a support group for procrastibakers. My entire blog was created due to procrastibaking while I should have been working on Open University assignments, lol! What a gorgeous cake this is! I love lemon and blueberry, they compliment one another so well. And I’m in awe of your cake decoration skills – when I throw something together to pass time on a Sunday it never looks like that!! Thanks Helen you’re too kind! The more I want to procrastinate the more intricate the cake decorating gets!! HA! This is such a gorgeous cake! I love the way you’ve decorated it and the colours that you’ve used. I was thinking about making a cake with lemon & blueberries and having seen yours I’m loving the gorgeous way you have decorated it and the colours are perfect together. Thanks for all the tips about nozzles, I love the Wilton brand, they do really work and you have shown us that!